Haycroft Stables would like to thank the following generous sponsors of our Junior Equestrian Programs. With their support, we are able to offer continuous Training Programs and Clinics at reduced rates, for riders and guests in the King City/Vaughan area and beyond. Please take the time to let them know that you appreciate their support. 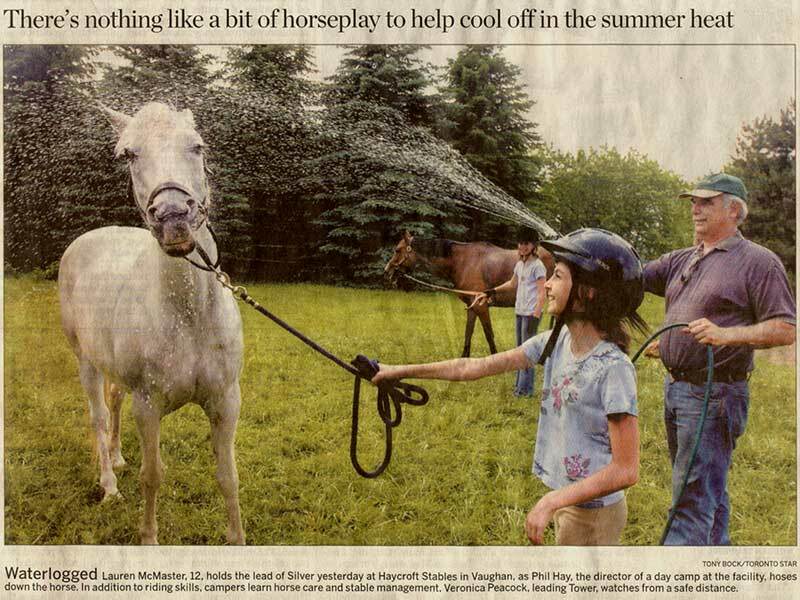 Recently, Tony Bock of the Toronto Star stopped by to check out the fun at Camp Haycroft. The following day, this photo ran in the Toronto Star. Several Haycroft riders attended the Foxhunter Horse Show in August with their trusty mounts and competed for the first time. Congratulations to Lauren, Isabelle, Adam, Kelly, Veronica, Alexandra, Susanne, Lindsay and parents, who made “Team Haycroft” a sparkling success. Eight (8) riders and five (5) horses competed in various divisions and won nearly 30 ribbons. Well done everyone! Our Photo Contest is almost over! Have you captured that perfect photo yet? Don't miss out. The deadline for submissions is September 15th at midnight. There will be some really great prizes awarded for the best photos in each category. Haycroft Stables was opened in February 2003 by Philip Hay, long time rider, competitor, and now Professional Coach & Trainer at Haycroft. Prior to opening his own training facilities at 2073 King-Vaughan Line in Maple, Ontario (2 driveways east of Keele Street on the south side), Phil taught his students in various shared facilities, concentrating on English-styled riding in the Hunter & Jumper disciplines. At Haycroft Stables we offer riding lessons on high quality school horses, capable of taking our students from beginner to the show ring. Lessons are conducted 7 days a week from 11:00 am until approximately 8:30 pm. To get more information, click on one of the links above. Haycroft Stables is an excellent facility with 23 spacious stalls available for boarding, 2 wash stalls with hot water, heated viewing room looking into our 80' X 200' indoor arena, washrooms, 35 acres, 100' X 200' outdoor sand ring, and many more amenities and features. Our friendly environment offers a comfortable and fun atmosphere for riders and horses alike. We are conveniently located just south of King City, Ontario within easy driving distance of the greater Toronto area and points north. Our web pages will offer several categories of information, news, fun and tips about our sport. Updates will be entered regularly; so visit all of our sections to see what’s new. PHOTO CONTEST: Get your cameras ready!!!! You could win great prizes (Including a fabulous “Grand Prize") just by submitting photos you have taken in and around the horse shows, barns, fields, etc., in several categories. Click here for more details. STORY TELLING CONTEST: Watch for this fun feature in the Fall 2004. Tell your best horse-related story, in your own words, and our talented panel will judge the original tales and pick the “Winners". Again… Great prizes!!! SELL YOUR USED ITEMS: Place a free ad in our “Haycroft Sales Barn” (by category) and you can get $$$$ from unwanted items. This feature should be ready within the next few weeks. So check back with us to list your items. You do the selling directly and NO Fees or Commissions are due to Haycroft Stables . That’s right… it's FREE! SUMMER CAMP 2004: spaces are still available for some weeks in our summer riding day camp. Come enjoy the fun and riding experience that has made our weekly riding day camp session the best fun in York region. Click on “Camps” for details. If you'd like to see some pictures of our campers this year click here. RIDING SCHOOL: Haycroft Stables has openings in the Riding School for students at all levels. 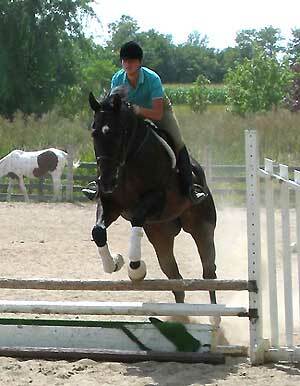 We offer professionally organized riding programs, taught by talented and professional coaches and instructors. Our school horses are “ex” show horses, and well-trained, quiet safe mounts for all levels of training. Call or contact us by e-mail phay@haycroft.ca for your introductory lesson. BOARDING YOUR HORSE: At Haycroft Stables horse care is our first priority. Your horse will receive customized care according to your needs at very reasonable prices. Training board includes weekly lessons, turnout, custom feed and show prep for horse and rider. Contact phay@haycroft.ca to arrange a visit and tour of the facility. Thanks for visiting our site today and remember to come back regularly for more features and information. • Watch for the next issue of Haycroft's informative newsletter. COMING SOON! • Videos of shows, riders in action, training tips and much more. • Pictures of our riders. We will include your pictures of interesting subject matters. Just send them to us by e-mail. Click “Contact Us”. • Updates on training clinics, Pro tips. • Mini Market where you will be able to list items for sale; “FREE"! We would like to hear from you. Please give us your comments and suggestions. Just click on the Contact Us link above. Rolling is as enjoyable to horses as backrubs or stretches are to humans.